Red Lobster uses bamboo skewers for the shrimp. You can substitute thin metal skewers if you can’t find bamboo ones. If you are using bamboo, soak them for 10-15 minutes before inserting into the shrimp. This will help prevent the wooden skewers from burning while the shrimp are grilling. In this maple glazed salmon recipe, the chef bakes the salmon on cedar planks. The wood adds a smoky flavor to the fish. Combine syrup, soy sauce, water and cherries in small sauce pot over medium heat. Squeeze juice from half lemon in mixture and stir well. Once mixture is heated, begin adding ¼ cup of sugar and stir until complete dissolved. Taste glaze for sweetness. As different maple syrups will have different levels of sweetness, it might be necessary to add additional sugar. Once glaze is sweet enough, remove from heat and refrigerate. When completely cool, cover and store chilled. Use at room temperature as glaze for grilled fresh fish. After soaking the skewers, slide 6 shrimp onto each skewer, leaving room on either end. Brush both sides with olive oil, and season with salt and pepper. Brush salmon with olive oil, and season with salt and pepper as well. Place salmon on grill skin side up. Grill approximately 5 minutes, then carefully flip on grill. Baste with maple cherry glaze, and continue to cook approximately 5-10 more minutes. When salmon has cooked approximately 5 minutes, place shrimp skewer on grill and cook 2-3 minutes per side, basting with maple cherry glaze once per side. 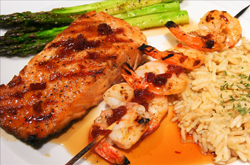 Place salmon on plate, top with shrimp skewer, and top with remaining maple cherry glaze. Garnish with fresh grilled asparagus. This entry was posted in Articles & Reviews - podcasts, apps, websites, recipes, videos, photography, Articles and reviews about excellent recipes and tagged how to make maple-glazed salmon and shrimp, how to make Red Lobster maple-glazed salmon and shrimp, maple-glazed salmon and shrimp how-to video, maple-glazed salmon and shrimp recipe, recipe for maple-glazed salmon and shrimp, recipe for Red Lobster maple-glazed salmon and shrimp, Red Lobster maple-glazed salmon and shrimp, Red Lobster maple-glazed salmon and shrimp copycat, Red Lobster maple-glazed salmon and shrimp recipe, Red Lobster maple-glazed salmon and shrimp recipe how-to video, Red Lobster recipes.